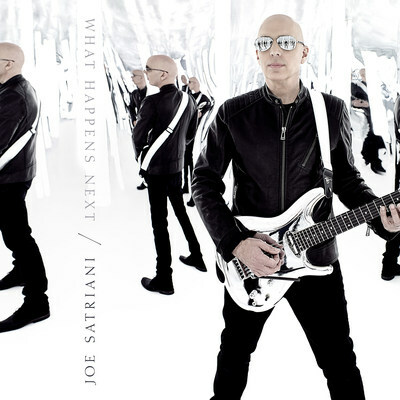 SAN FRANCISCO, Sept. 18, 2017 /PRNewswire/ -- World-renowned guitar virtuoso, JOE SATRIANI, announces the release of his 16th solo album, What Happens Next, set for release, January 12, 2018 on Sony/Legacy Recordings. Just a day prior to the album release, SATRIANI revives his G3 tour entity, inviting Dream Theater's John Petrucci and Def Leppard lead guitarist, Phil Collen to join him. The G3 tour launches on January 11 in Seattle, WA and continues across the U.S. before winding up on February 25 in Milwaukee, WI. There is a special tour pre-sale promotion giving fans the opportunity to buy concert tickets with the new album as well as VIP packages. Visit https://lnk.to/WHN for more information, pre-sale opportunities and specific market pre-sale and on-sale dates. The new, instrumentally electrifying album features a power trio of legendary status; SATRIANI on guitar and Rock and Roll Hall of Fame inductee bassist Glenn Hughes (Deep Purple/Black Country Communion) and drummer Chad Smith (Red Hot Chili Peppers), the latter reuniting with SATRIANI for the first time since their work in the supergroup Chickenfoot. SATRIANI is once again joined by producer/engineer/mixer Mike Fraser, his frequent collaborator over the last 20 years, on What Happens Next. Fraser is well-known for recording/mixing every AC/DC album since 1990's The Razors Edge along with his classic works with SATRIANI going back to the release of Crystal Planet in 1998. These new tracks literally vibrate the soul with an energy rarely found these days. From the dynamic opening track, "Energy", to the majestic crunch of "Thunder High On The Mountain", and the easy, sensual cords of "Smooth Soul". This unparalleled rock-rhythm section gives What Happens Next a depth of groove that sets it apart from SATRIANI's other work. Since its debut in 1996, SATRIANI's G3 tour has featured the world's greatest guitarists (everyone from Steve Vai and Eric Johnson to Steve Lukather and Robert Fripp) and has become a consistent concert hall sell-out attraction in the U.S., South America, Europe, Australia and Japan. "I could say that I'm surprised at the durability of G3 and how much it's grown, but in a way I'm not," SATRIANI says with a laugh, "I think part of its charm and its mojo is in the chemistry of having three top guitarists share what they do on stage. It's fun, it's unpredictable, it's wild – it's everything you could want in a show." In addition to this new album and exciting tour news, a new documentary "Beyond the Supernova" shot by SATRIANI's filmmaker son, ZZ, makes its debut at the Mill Valley Film Festival this October. The tour documentary chronicles Joe, along with his band and crew, on their last "Shockwave Supernova" tour throughout Europe and Asia. Satriani's Strange Beautiful Music: A Musical Memoir first released in May 2014 will now be available in paperback. Pre-orders are available now with the official release on November 7, 2017. The paperback version includes a new chapter focusing on SATRIANI's last album, Shockwave Supernova. Read an excerpt from the new chapter HERE. For two decades, the guitar virtuoso has traveled the world, playing to sold-out crowds as both a headliner and as founder of the all-star "G3" guitar extravaganza. SATRIANI's studio and live recordings have sold more than 10 million copies worldwide to date and of his many solo albums, two have gone platinum and four others went gold, with 15 Grammy nominations between them. His side project, Chickenfoot, featuring former Van Halen front man Sammy Hagar, former bassist Michael Anthony, and Red Hot Chili Peppers' drummer Chad Smith saw their debut album certified gold and their second studio album debuted at #9.